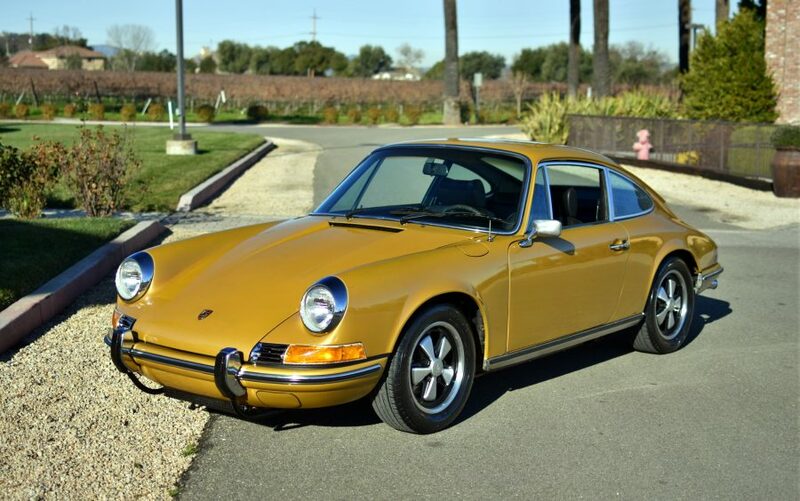 1972 Porsche 911T Coupe with numbers-matching engine and factory air conditioning. Garaged California car with solid original floors, rare color combination. The air conditioning system is complete and listed on the Certificate of Authenticity (needs to be charged and checked, does not blow cold). Stored many years and not driven, recently brought back to running condition (tank cleaned, seals replaced, new tires, brakes done, etc). The seats and carpet are all original and in excellent condition, which seems to indicate the miles on the odometer could be original, 65563. One repaint since new, paint is 20 years old and shows patina but presents well. Runs and drives well..